UDP Renewables of businessman Vasyl Khmelnytsky on March 1, 2019 launched its third solar power plant Scythia Solar 1 in Zaporizhia region with a power capacity of 13 MW. The company’s press service reported that investment in the project reached $10.1 million. The plant consists of 38,232 solar panels produced by JinkoSolar. It will allow generating nearly 16.2 GWh per year. The plant is located on an area of 20 ha. EPC contractor is a Ukrainian group of companies KNESS. Financial partner of the project is Ukrgasbank (Kyiv). According to a posting on the website of UDP Renewables, it plans to boost the capacity of solar power plants from 24 MW to 175 MW this year. As reported, in November 2018, UDP Renewables launched the 18.3 MW Free-Energy-Henichesk solar power plant in Kherson region. Investment totaled $18 million. UDP Renewables currently also operates Dymerska Photovoltaic Power Plant 1 (Kyiv region) with a capacity of 6 MW. UFuture Investment Group, headquartered in Brussels, was established in autumn 2017 and united the business projects of Khmelnytsky. The group includes the Ukrainian development company UDP, which core business is the implementation of large infrastructure projects. UDP Renewables, responsible for the development of projects in the field of renewable energy of UFuture Investment Group belonging to businessman Vasyl Khmelnytsky, has commissioned the 18.3 MW Free-Energy-Henichesk solar power station (Kherson region). According to the press service of the company, investment in the plant construction amounted to $18 million. The planned annual volume of electricity generation is 23,500 MWh, which will allow providing 9,000 households with energy. 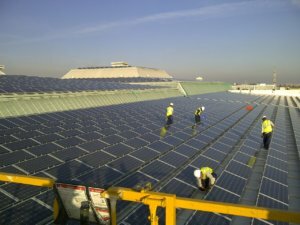 During the construction of the plant, some 65,340 JinkoSolar panels were used, while additional goods and services were purchased from Ukrainian suppliers. Ukrgasbank acted as a financial partner of the project, KNESS group of companies was the general contractor, the company noted. “We continue to develop in the “green” energy sector, as this is one of the most interesting areas of business in Ukraine today. Over the past year, the solar plants’ capacity in our country has almost doubled, but we still have room to grow compared to Europe, where the share of renewable energy averages 8.5%,” the press service said citing founder of UFuture Investment Group Vasyl Khmelnytsky. The company also noted that UDP Renewables’ development strategy provides for the implementation of energy projects with a total capacity of 200 MW in the southern regions of Ukraine in 2018-2019. Free-Energy-Henichesk solar plant is the second realized project of UDP Renewables, which currently also manages 6 MW Dymer solar plant-1 (Kyiv region). The Antimonopoly Committee of Ukraine has approved the purchase of a controlling stake in Dymerka Solar Poland (Poland) by ACCIONA Energia Global (Poland, the subsidiary of the eponymous company in Spain), the press service of the committee has reported. Dymerka Solar Poland was registered to implement a project of UDP developing group (Kyiv) to expand the capacity of Dymerka solar power plant (Kyiv region) from 6 MW to 57.6 MW. As reported, UDP from UFuture investment group has arranged a joint project to expand Dymerka solar power plant with Spain’s ACCIONA Energia Global. It is planned that the Spanish company will invest EUR 54.7 million. Majority shareholder of UDP is Ukrainian businessman Vasyl Khmelnytsky. UDP (Kyiv) from the UFuture investment group has arranged a joint project to expand Dymerka solar power plant (Kyiv region) from 6 MW to 57.6 MW with Spain’s ACCIONA Energia Global, the press service of UDP reported on Friday. arket will be the development of the second, third and fourth stages of the Dymerka solar power plant in Kyiv region with a total peak capacity of 57.6 MW. The first phase of this plant was commissioned by UDP Renewables in the summer of 2017. The total volume of foreign direct investment only in this project is EUR 54.7 million,” UDP said. 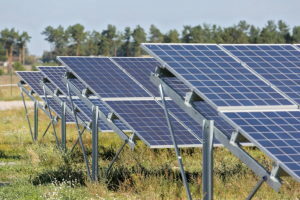 The founder of UFuture Vasyl Khmelnytsky said that the launch of the Dymerka solar power plant at a full capacity is scheduled for the first quarter of 2019. “I believe that this example would stir up the process of attracting investment and the global expertise, which is also important,” UDP reported, citing Khmelnytsky. ACCIONA Energia CEO Rafael Mateo said that the Spanish company starts its operations in the renewable energy sphere in Ukraine with support of the European Bank for Reconstruction and Development (EBRD). The UDP said that they arranged with Acciona Energia Global to work together on a broad portfolio of investment projects in both solar and wind energy in the Ukrainian market. As reported, the first stage of the solar power plant in the village of Velyka Dymerka (Kyiv region) with a capacity of 6 MW was registered for Dymerka solar power plant-1 LLC. The company belongs to the majority shareholder of the UDP development company Vasyl Khmelnytsky. ACCIONA Energia Global from ACCIONA Group headquartered in Madrid is a global leader in renewable energy with 25 years of experience. UDP Renewables is a Ukrainian developing company in the renewable energy sphere. UDP (Kyiv) has arranged a joint project to expand Dymerka solar power plant (Kyiv region) from 6 MW to 57.6 MW with Spain’s Acciona Energia Global, the press service of UDP has reported. “The first project of the Spanish energy giant on the Ukrainian market will be the development of the second, third and fourth stages of the Dymerka solar power plant in Kyiv region with a total peak capacity of 57.6 MW. The first phase of this plant was commissioned by UDP Renewables in the summer of 2017. The total volume of foreign direct investment only in this project is EUR 54.7 million,” UDP said. 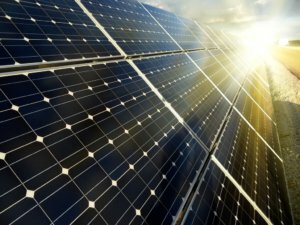 The launch of the Dymerka solar power plant at a full capacity is scheduled for the first quarter of 2019.